WHAT A BLAST! We had an inexperienced party of 3 and had an AMAZING TIME! Couldn’t have asked for a nicer, more pleasant tour guide than Gerry and the entire staff was an absolute pleasure to deal with. Never ever felt rushed or uncomfortable at all the entire tour. Visited Downtown Manhattan and the Statue of Liberty. Absolutely SURREAL! Gerry was more than happy to help us take HUNDREDS of photos which is just above and beyond any other Jet Ski rental place that charges you for their own photos that may or may not come out good. All the equipment was spotless and their business model is as good as it gets. We are all NYC natives and never ever thought this city would look so unbelievably stunning in the open waters! If you’re undecided about which Jet Ski Tour company to go on, DO NOT HESITATE to come here! Will definitely come back next season! This was the best experience ever. Our guide was so wonderful . Anyone looking to tour nyc in a different way should definitely call this guy. Tour is not rushed very comfortable and fun. Great customer service friendly safe. What a great experience!!!! Wow!!! I went there twice already and both times tour was amazing!!! Jerry is awesome. He started our day with a little instructions just to make sure we will be safe on a water. Then we headed towards Statue of Liberty. Phenomenal view. We went up to GW Bridge and back to Brooklyn & Manhatten Bridge. Then we headed to Verrazano Bridge and let me tell you something. The way he handled our tour was GREAT!!! Whats better to see NYC from water. Even though whole my body is soar but it was worth of trip and every dime paid. I would recomend this tour to everyone!!! Great job Jerry…!!! Thank you so much and you will see me again soon back to the jetski!!! I had arranged to go jet skiing for a friend’s bachelor party but the company I hired in Jersey cancelled on me when I arrived at the pier. Obviously this was about to ruin the bachelor party. After some frantic searching I found Skyline Jet Ski Tours, I called up and Jerry drove back in from home in order to help me keep the bachelor party going. It was absolutely amazing, We took a ride around the Statue of Liberty, Manhattan and up by Brooklyn Bridge and more. It ended up being much better than if we had taken it from Jersey because the cruise from Staten Island gives you time to breathe in the spectacular views. This summer I have been to England, Spain, Morocco, Malta, Guernsey, Italy and Romania but nothing compared to my time on the jet ski. I have to point out that Jerry made it a great time, he didn’t feel like an instructor so much as an extra friend on the water with you. I am 100% going back for another cruise around NYC with Skyline Jet Ski Tours and after I showed the pictures to my wife, she is coming too! I spent 3 weeks in NYC in July-Aug 2014. One of the things I would highly recommend is a jet ski tour with Jerry. 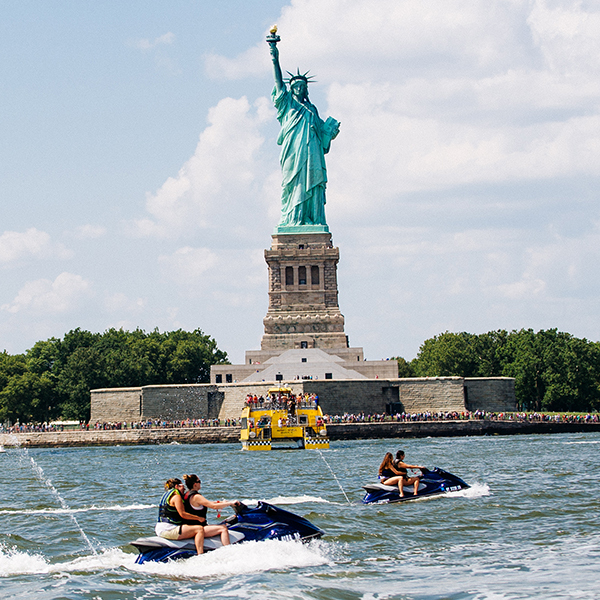 I took a 2.5-3.0 hour jet ski tour circling the entire Manhattan island with him. It was a great experience and I cannot speak highly enough of it. What I really like is that he does not rush you through anything. If you want to cruise around slowly or keep stopping around to take photos (as many as you want) he is more than happy to do so. If you are not comfortable going fast and take even 3.5 hrs to complete he wouldn’t mind at all. This was my first time jet skiing and he helped me get a hang of it very quickly. The entire ride had a mix of all kinds of experiences – jumping through the slightly choppy waters from Staten Island to Liberty island to Manhattan and through to mid town Manhattan; then cruising at high speeds through the relatively calm waters of Hudson along the uptown coast; and then cruising at slightly slower speeds along the narrow stretch of the east river along Queens and the Yankies stadium. Jerry was more than happy to keep clicking away photos on my phone and we got some insane snaps. 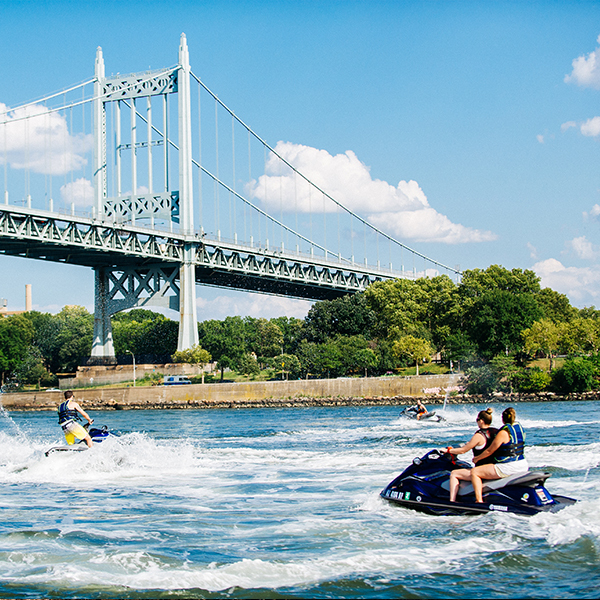 I had done an extensive research about all the jet ski tour providers in the city and picked Skyline – and boy was I glad!! Most of the other guys don’t easily provide a full circle tour and you spend unnecessary time with them skiing from the east to Manhattan. You can rather spend your time better with Skyline as you start much closer and reach Manhattan quickly. Their jetty is also more easily and quickly accessed than others – just a short ride from the Free Staten Island Ferry terminal. He was also happy to schedule a private tour for me since I had scheduling constraints! Thanks Jerry!